It all started with Instagram. The wanderlust-ing, frantically adding and reorganising my Travel Wishlist, in fact all that stunning imagery from some of the most beautiful destinations in the world was part of what inspired me bring together and share my own travel stories here on the blog! So here I am kicking off a series of blog posts from my personal ‘Travel Wishlist’, where I bring together some of the photographs that have gotten me impatient to get going again and why it is that I want to go there. To tick atleast 5 places off the UNESCO World Heritage Sites List and more. Considered to be an outstanding representation of the Modern Movement of Architecture in Europe, translated to the local context of Israel’s culture and climate, Tel Aviv would make for an eclectic destination with its mix of heritage and the very happening nightlife that is known for today. So, here I could go from day to night, from photographing heritage sites to sunsets on the beach, from early morning seascapes to late night cityscapes. Oh, and not to mention shopping at its many bazaars! This trade route to the Mediterranean ports flourished for over seven hundred years from the 3rd century BC to the 4nd century AD. Over a hundred kilometer stretch in the desert of Negev is what was once the ancient Incense Route and I would love to wander amongst the ruins and discover what UNESCO calls a completely fossilized cultural environment. Desert settlements with towns, fortresses, caravanserai, and sophisticated water conservation systems along this harsh desert route stand witness to just how prosperous the trade in incense was then. A Biblical City – the Old City of Jerusalem is the City of David and is also where Jesus was crucified – it is holy for Jews and Christians alike. It is also believed that, it was here in one of the oldest cities of the world that Prophet Mohammed rose to Heaven making it a holy city for all the three major Abrahamic religions. Did you know that World Maps were once drawn with the ancient city of Jerusalem at the center? The only three continents discovered at the time, Europe, Asia & Africa were set around this city built by King David in 1004BC. Now, how can you resist that?! A walled city over the sea, Acre is yet another ancient holy city. The Old City of Acre has survived centuries, with the remains of a medieval Crusader town from 1104 relatively undisturbed and living on, both above and below today’s streets along with an Ottoman town of the 18th century partly built on top of these Crusader structures. One look at a picture of the ‘Hanging Palace of Herod’ and you will not want to miss going here. Rome was not built in a day they say, and this palace of the Judaen king Herod was built in in the classic style of the early Roman Empire. Need I say more? 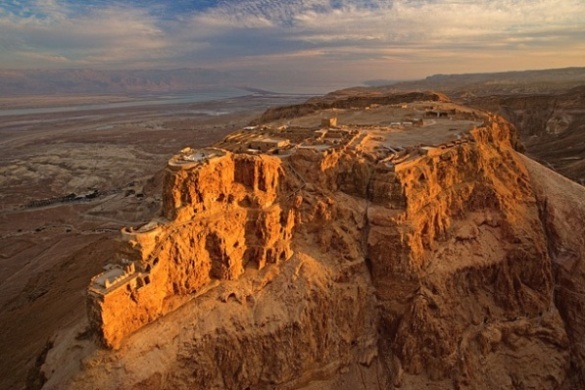 Set dramatically – overlooking the Dead Sea, this rugged fortress of the ancient Jewish Kingdom of Israel is the most complete monument of the Roman siege works to have survived for over 13 centuries, intact till today. To float in the Dead Sea, of course! Who hasn’t heard of the Seven Wonders of the World and not wanted to see for oneself atleast one of them? & also, I already know what I am going to eat when in Israel. Hummus! PS: This post was made possible by The Ministry of Tourism, Israel. So, do go watch their video on Israel and you are sure to find something to fall in love with. Wow….new places to see….some i am hearing about for the first time!! Very interesting!! Hmm..the first picture of the beach did not fit in our minds about what Tel Aviv is about! Naturally this means our minds had been closed…now its reopened.Thanks! Never knew Isreal has so many hidden wonders! Thanks for adding one more place to our bucket list! 😁 Thank you I myself discovered so much more while writing this! Can’t wait to go to Herod’s Hanging Palace.